On moving to Canada from his original home of Haïti, pianist and singer/songwriter Henri-Pierre Noel brought with him much of the tropical island’s influences. The Kompa Funk sounds of his homeland, along side contemporary North American jazz and disco, ran throughout Henri’s 1979 album “Piano”, re-released by Wah Wah 45s in 2012, and now it’s time for a second helping with the reissue of 1980’s dance floor friendly “One More Step”, both albums having been originally released on very limited private presses and since become holy grails of the back music scene. 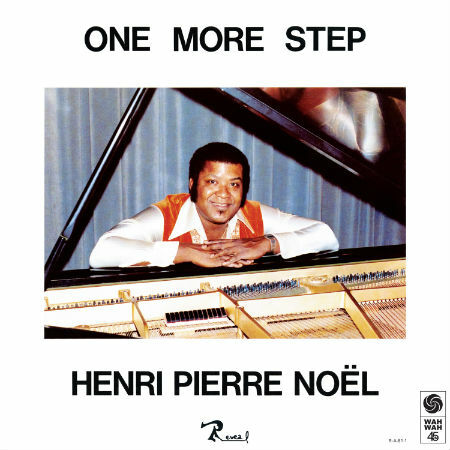 Henri-Pierre Noel is an incredibly versatile musician who uses the piano in a very percussive and syncopated way, almost like a drum. This particular technique naturally brings disco and afro-funk elements into his unique brand of dance floor fusion. The man himself is still playing in his adopted home of Montreal today, and having been introduced to Wah Wah 45s label boss Dom Servini by Canadian DJs Kobal, Moonstarr and Andy Williams, who were all keen fans of his early works, it became clear that Noel’s finest moments needed to be re-released and re-discovered by a new generation. Re-mastered from the original multi-track tapes by Kevin Moonstarr in Canada, and featuring seriously foot friendly cuts like “Afro-Funk Groove”, “Funky Spider Dance” and “Latin Feeling”, as well as firing female vocals and a plethora of percussion, Henri-Pierre Noel’s sophomore LP is finally available to all on heavyweight vinyl, CD and digital formats, including full sleeve notes from Reveal Records boss, Peter Riden.